Out amid the sagebrush and steel horses, adventure photographer Ben Herndon spent four days waiting on the wind. 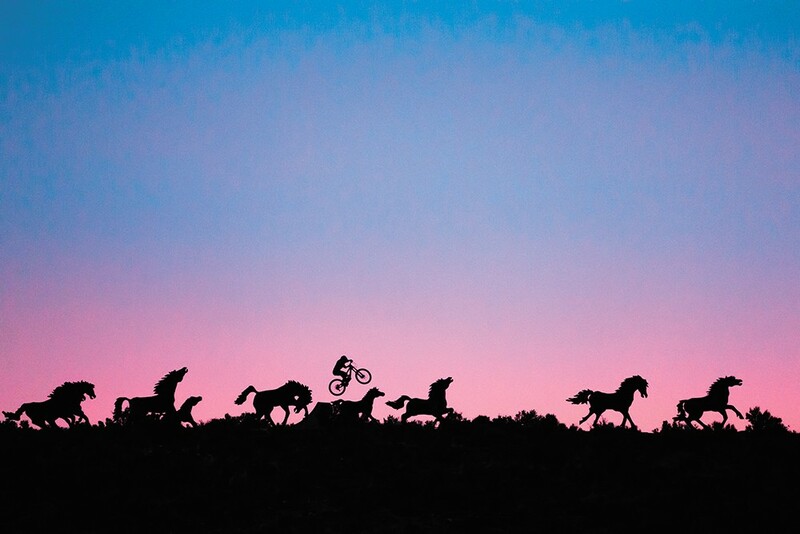 He awoke at dawn each day in hopes of photographing a sunrise silhouette of a mountain biker hurdling over the Wild Horses Monument near Vantage. Herndon, 32, of Moscow, says he spent about a year dreaming about snapping that photo at the public art piece, formally titled "Grandfather Cuts Loose the Ponies." Once Utah-based mountain biker Jeremy Hottinger came on board, Herndon knew he could make it work. "That's what you want to chase," he says, "that little bit of satisfaction when you feel like you've captured something different." Herndon got his start as a print journalist, taking photos as part of his work at the Port Townsend Leader on the Olympic Peninsula. The more he hiked, camped and climbed, the more photos he took. When he moved to Moscow, he started building relationships with clients and outdoor athletes that has grown into a full-time gig. 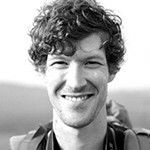 While shooting rock climbers, skiers and paragliders, Herndon says he enjoys capturing their interactions with the land. He loves the geology of the Inland Northwest and is working on a series of photos to showcase the unique terrain that shapes regional recreation. Like the high desert near Vantage, where once the wind died down Herndon got his shot. "If it's a fun idea, in a beautiful place, with good people," he says, "that's what I live for." 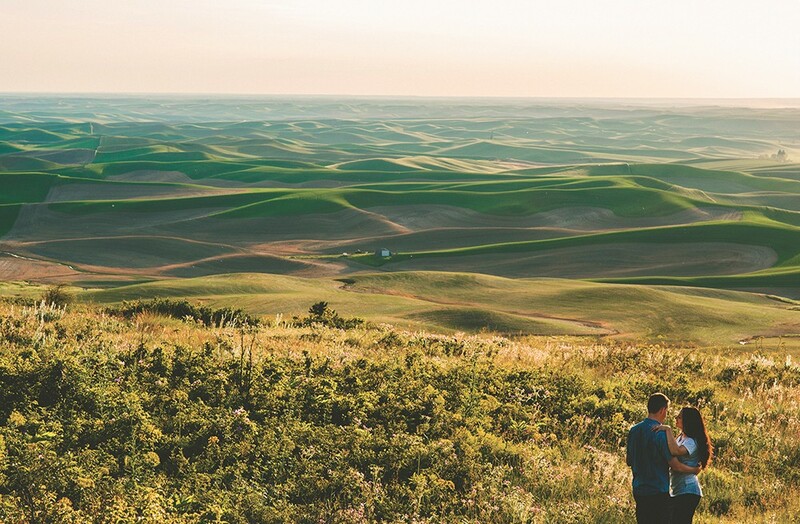 Kyndall Elliott's photo of Steptoe Butte. Usually she would scout the location ahead of time. But her clients — a couple who met at Idaho Fish and Game — had never visited the top of Steptoe Butte. Despite living on the Palouse for several years, wedding photographer Kyndall Elliott hadn't either. And she hoped to catch some of that raw wonder in their photos. They picked a day in May when the fields would be at their greenest. Then the couple stepped out against the rolling horizon, forgot about Elliott's camera and lost themselves in the landscape. "It just made it really special to me," she says. Elliott, 29, grew up in Houston, Texas ("Not a very pretty place"). And watched her parents go through a messy divorce. Now she dedicates her photography to capturing candid moments of affection in some of the most beautiful places on Earth. 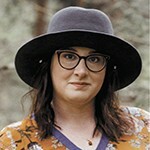 "I tend to draw people who really love the outdoors," she says, "people who want to highlight not just the love they have for each other, but the love they have for where they live." Elliott says the key to shooting outdoors is adaptability. She recently shot a whole wedding with an umbrella in one hand. She has shot photos in national parks, Costa Rica, Italy and elsewhere. Trust in your preparation and experience, she says. Keep the focus on love. "You can make your own magic," she says. "At the end of the day, it's just really beautiful and worth it to me." 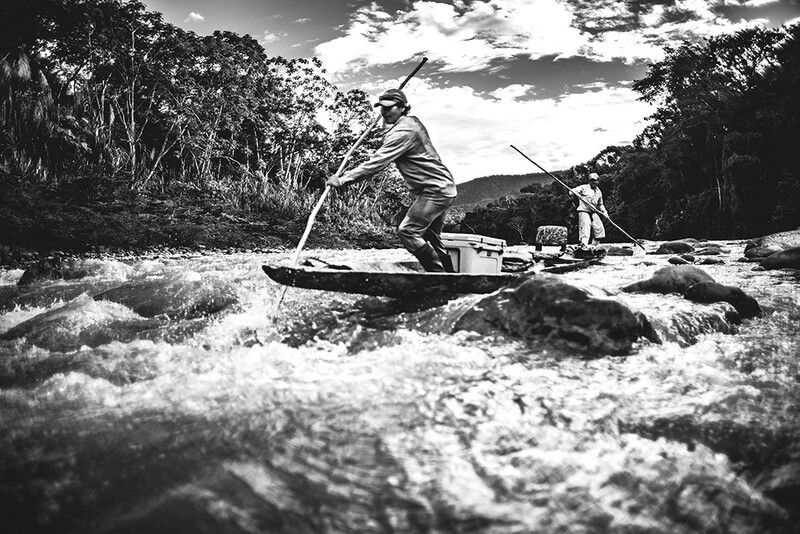 Deep in the jungle of Bolivia, on the Itirizama River, their canoe came to a short stretch of shallow rapids. Spokane fly-fishing photographer Michael Visintainer stepped out of the craft so his indigenous guides could navigate the narrow passage. Visintainer and his six clients all hauled fly rods and fishing gear, so he had made room for just a small digital camera. He watched the two men work the churning waters like experts — and raised his lens. "This photo was a spur of the moment shot," he says. 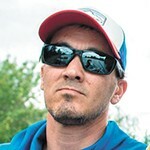 Visintainer, 37, works as a manager at Silver Bow Fly Shop in Spokane Valley. He typically turns his camera on the rich color and detail of native redbands or Montana brown trout, elevating the old "grip and grin" of trophy photos to an art form. In addition to the mountain streams and rivers of the Northwest, Visintainer has swung flies in Mexico, Cuba and the Bahamas. On this trip, he had come to fish for golden dorado — massive, brilliant yellow fish — in Isiboro Secure National Park. "Golden dorado are very large, predatory freshwater fish with sharp teeth," he says. "The dorado attacks a fly like a bass, leverages like a steelhead and jumps like a tarpon." When he looks back at the photo of his two guides working the rapids, he says he remembers their skill, but also their humor as they splashed each other playfully. His takeaway? "Have fun," he says, "while working hard." See more of Visintainer's work on Instagram: @michaelvisintainer. The original print version of this article was headlined "Natural Light"